This was my face when my stupid port was clogged again this week. Luckily, my amazing nurse, Aimee, got it unclogged much quicker this time around and I was off and running with Round 12. Both Cortney and my mom were there with me again. We sent Cortney to work because he seemed to be a bit bored with our chit chat. I have to say, though, I appreciate that he has been to every single one of my treatments and appointments. He refuses to let me ever be alone in this. And even though my mom shows up too, he is there–he is my person. He is my rock even when he doesn’t feel very solid himself. I honestly couldn’t be getting through this the way I am without him. 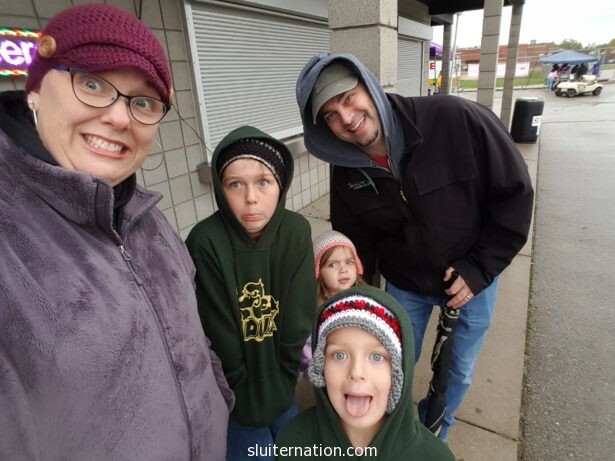 Cortney has made rest and recovery after each treatment possible even though often it means increasing his own workload and managing the kids and schedule stuff on his own. 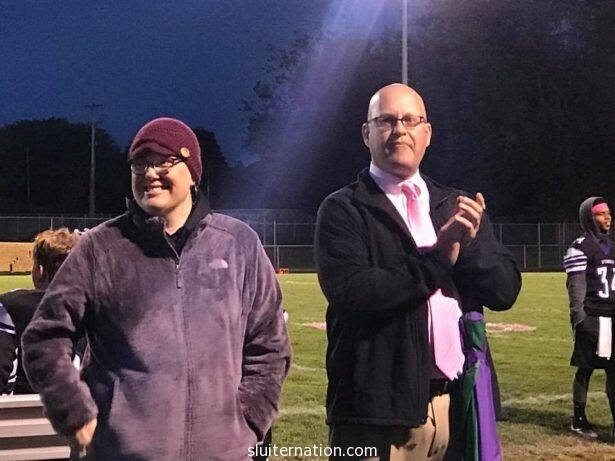 My school district had their breast cancer awareness football game last night, and they asked if I would come and be recognized as a survivor. I was honored that they wanted to include me. I had my reservations. I said yes because I was told it could bring the community together and give them hope. I want to do that for people. I want them to see hope and not despair when they see me going through my journey. But I was nervous too. I don’t want to be The Cancer Teacher. I struggle with having the spotlight on me for something I feel is not my own hard work, but luck. I was lucky to have it caught so early. I am lucky to have the support I do. I am lucky that my body is responding so well. And truth be told, we won’t know until I am done and off the chemo and done with radiation whether or not it “worked.” The cancer could come back. We all know there are no guarantees with cancer. It is a brutally and infamously unfair disease. We packed up the family anyway, and headed out to the stadium. It was cold and drizzling out. Eddie, Charlie, and Alice were heavy on the whine and light on the “proud of our mom” attitudes. I was struggling with my self-confidence and whether or not I was really deserving of all this. Hanging out before the game and during the first quarter; however, many students came and said hello. Former students (who are all high schoolers now! OMG, my 8th graders have grown up!) gave hugs and told me they were glad I was there. And after the first quarter of the game, they invited me out with our superintendent to be recognized. Did I mention it was quite chilly? I have on three layers! I don’t know how Mr. Hoekstra doesn’t have a stocking hat on because my bald head was COLD. Anyway, it felt good to hear the announcer talk about my years of service in Wyoming Public Schools (this is my 16th year, but I did my student teaching and two years of long-term subbing, so I’ve been around since 2001) and how many students I’ve impacted. And then I looked up into the stands (which were sparsely populated due to the weather) and heard, “MRS. SLUITER!! !” and saw some frantic waving from my current students. I waved back and they cheered. I still feel weird about being recognized while I go through my journey, but I am a survivor right now. 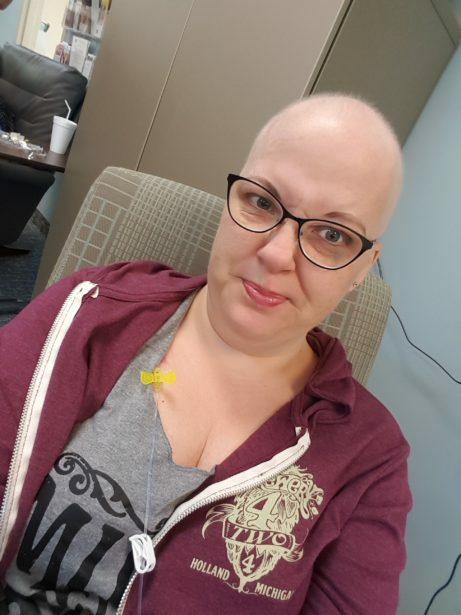 I am in remission even if I am still getting treatment. And I only have four more chemo rounds to go before the next leg of this tour gets underway.